Stop the presses. The sky is not falling over Flushing. Salt and pepper was back in business Wednesday night as the New York Mets got a redemption rally over their NL East rivals in their 11-5 win. Two consecutive losses unleashed a wave of concern, and although a bit warranted, the bats and bullpen bounced back with a vengeance confirming that the Mickey Callaway Mets are really that good. Yoenis Cespedes said so long to his slump with a single and grand slam, capping a nine-run eighth inning outburst to avoid being swept up by the Nationals. Steven Matz settled down after a shaky first inning put the Mets three in the hole via a Howie Kendrick single, Bryce Harper walk and three-run blast off the bat of Ryan Zimmerman. The struggling veteran first baseman busted out of his slow start going 3-for-4 with a triple and additional solo shot in the ninth. In the bottom of the fourth, the Mets finally figured out Nats starter, Tanner Roark. Asdrubal Cabrera led off with a double to right, Todd Frazier walked and Adrian Gonzalez slapped a clutch RBI single. Zimmerman’s defense then played second fiddle to his offense, throwing a surefire double play ball off the bat of Jose Lobaton, pulling Kendrick off the bag at second, and scoring Frazier to pull the Mets within one. With runners on first and second, Callaway made the uncomfortable decision of removing a much improved Matz for the pinch hitting Brandon Nimmo, who was plunked to load the bases, and left at first after Ahmed Rosario hit into an inning-ending double play. Paul Sewald retired his first six batters, striking out three, then ran into a little trouble in the seventh surrendering a leadoff triple to Zimmerman and sac fly to Moises Sierra to put the Nats up 4-2. But the right-hander closed out strong striking out Michael Taylor and Wilmer Difo, swinging. With nothing doing offensively in the seventh, good fortune was abundant in the eighth when Nats manager allowed relief pitcher Ryan Madson to stay a little too long at the fair on his third straight day of work. Michael Conforto muscled a leadoff base hit the other way, Cespedes, 0-for-3 with a pair of strikeouts at the time, banged an 0-2 fastball up the middle, Cabrera loaded the bases with a single to right, Frazier brought in the tying runs with a rocket up the middle. Gonzalez drew an intentional walk, then Juan Lagares roped a pinch hit two-run double down the right field line. Rosario and Conforto received free passes, and A.J. Cole got the unenviable call to face Cespedes with the bases loaded, and his 0-2 95 MPH four-seam fastball didn’t fare too well. 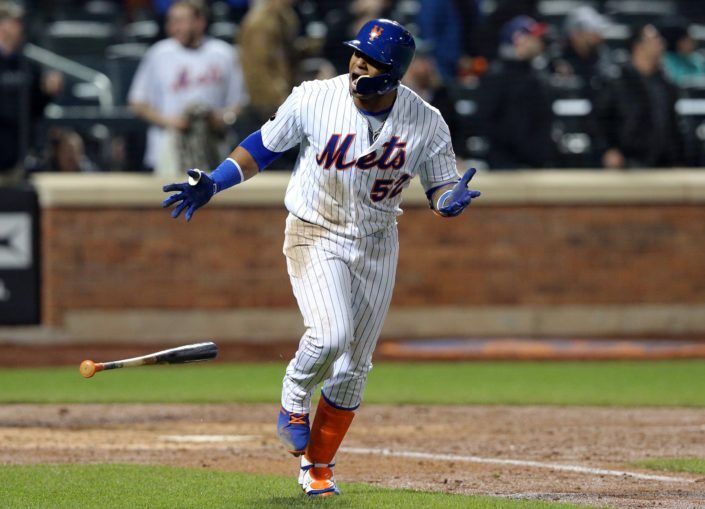 The Mets collected nine runs on six hits and three walks in their eighth-inning comeback rally. That is the team’s most productive inning in terms of both runs and hits this season, and their first time scoring at least nine runs in an inning since plating 12 runs in the third inning vs. San Francisco on April 29, 2016. It was a huge mental win for New York who could have easily fallen down a rabbit hole of a three-game losing streak. Instead, they embark on a 10-game road trip on a high note as the only big league club that remains unbeaten on the road.